Profound reflections on life and death from Ajahn Chah to an old woman during her last days. This reading is from a detailed translation by Ajahn Ṭhānissaro. Weekly podcast with teachings from Venerable Ajahn Anan Akincaño. Note: The subscribe button above only works for devices with iTunes installed (iPhones and iPads). If you use an Android device install Google Podcasts and search for “Ajahn Anan”. A short, informal discourse to the monks after the evening chanting about life in Wat Nong Pah Pong, the monastery that Ajahn Chah established, and how to keep the spirit of those practices alive today despite all the changes that have taken place in the last four decades. This talk displays how qualities such as respect, humility, energy and loving-kindness can be lived out on a day-to-day basis. On the occasion of his birthday, Ajahn Anan talks about the importance of joy, how to develop appreciation for the goodness of others and the best way to show our love and respect for our teachers. Ajahn Anan tells the story of the Buddha’s disciple Yasa and explains how it relates to the practice of the Dhamma in our lives. In this episode of the Friday night videoconference, Ajahn Anan discusses dukkha and the nature of liking and disliking. On the occasion of Asalha Puja, Ajahn Anan discusses the Four Noble Truths proclaimed by the Buddha in the Deer Park at Isipatana, as well as Venerable Añña Koṇḍañña’s realization of these truths. In this episode of the Friday night videoconference, Ajahn Anan discusses the problem of attachment to happiness and other topics. In this talk on the occasion of the new year, Ajahn Anan recalls the good we’ve done over the past year and encourages us to recall the Buddha and his teachings as a foundation for doing good in the coming year. From the Friday night videoconference with Ajahn Anan Akiñcano. Topics covered include breath meditation, abstaining from alcohol, metta meditation, Ajahn Chah stories, and Stream Entry. Ajahn Chah gives advice and encouragement—at times light-hearted and humorous, at others hard-hitting and profound—to a weary old monk. This talk is not found in the Collected Teachings. Q and A with the sangha of Abhayagiri Monastery. Ajahn Anan tells a story of a Zen master, his heavy-hearted disciple and a bamboo basket. Soon after the crumbling of a huge dam in Laos, Ajahn Anan gave this talk emphasizing the importance of maintaining firm mindfulness in order to keep suffering and the unwholesome tendencies of the mind at bay. In this talk on the occasion of Visakha Puja, Ajahn Anan explains the causes and conditions for insight into the truths of suffering, its origin, its cessation, and the path leading to its cessation. This talk includes Ajahn Anan speaking on the practice of giving as the foundation for the path to awakening, the Hinayana vs Mahayana traditions, and advice for young monks. In this talk, Ajahn Anan discusses using different meditation objects, the nature of “parami”, or spiritual perfections, using determination skillfully, and recollecting death as a meditation practice. On the occasion of the 10th anniversary of the Bodhikusuma Buddhist Center in Sydney, Australia, Ajahn Anan gives reflections on the nature of nibbana being not far away from us, and how nibbana can be seen in the present moment through mental development and learning to let go. In this set of questions and answers, Ajahn Anan speaks on his life and his early practice. He also covers topics such as eating meat vs. vegetarianism and skillfully relating to one’s children. In this episode, Ajahn Anan talks on the function of mindfulness as a protection for the mind, the practices of death and corpse recollection, renouncing sense objects, and a story of a monk from the time of the Buddha. Q & A – What is the Patimokkha? In this series of questions and answers, Ajahn Anan explains the monks’ code of conduct (Patimokkha), dealing with difficulties in the workplace, dealing with anger, and how to contemplate the Dhamma. In this podcast, Ajahn Anan gives a talk on the occasion of Vesak Puja, a day commemorating the birth, enlightenment, and passing away (parinibbana) of the Buddha. Ajahn Anan reflects on these events and encourages listeners in the practice of mindfulness. In this talk directed at the monastic community at Wat Marp Jan, Ajahn Anan discusses the importance of starting meditation time with loving-kindness practice, dealing with thinking, the recollection of death and corpses as meditation themes, and finding balance in mind training. In this series of questions and answers, Ajahn Anan covers topics such as loving-kindness (metta) practice as it relates to insight, how to explain Buddhism to those unfamiliar with it, and objects that are suitable for contemplation in meditation. 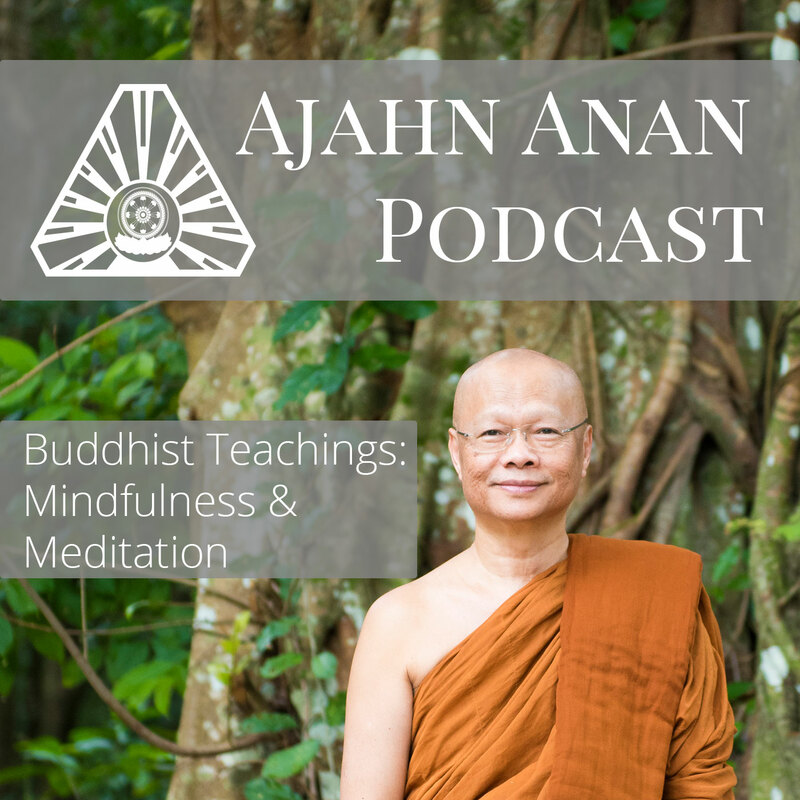 In this podcast, Ajahn Anan describes the progression of meditation practice from making the mind peaceful and cooling down mental disturbances, to continuous mindfulness, the arising of concentration, and the mind’s release to seeing the nature of reality.